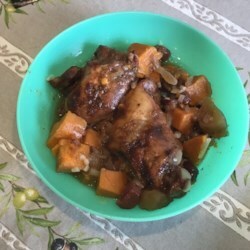 I made this recipe for 2 adults who like chicken, sweet potatoes and cranberries. I really liked the whole dish, the other person did not appreciate the cranberries with her vegetables. I used a lg. sweet potato that I peeled, but did not precook and my chicken breasts were added right from the freezer to the recipe. I put the chicken on top of all the vegetables. and covered the casserole dish. Everything was ready in 60-75 minutes and the chicken was not dry because it was cooked covered. I will certainly make this again. Because my sweet potato was quite large and both carrots and sweet potatoes are orange starches, the carrots were omitted this time.